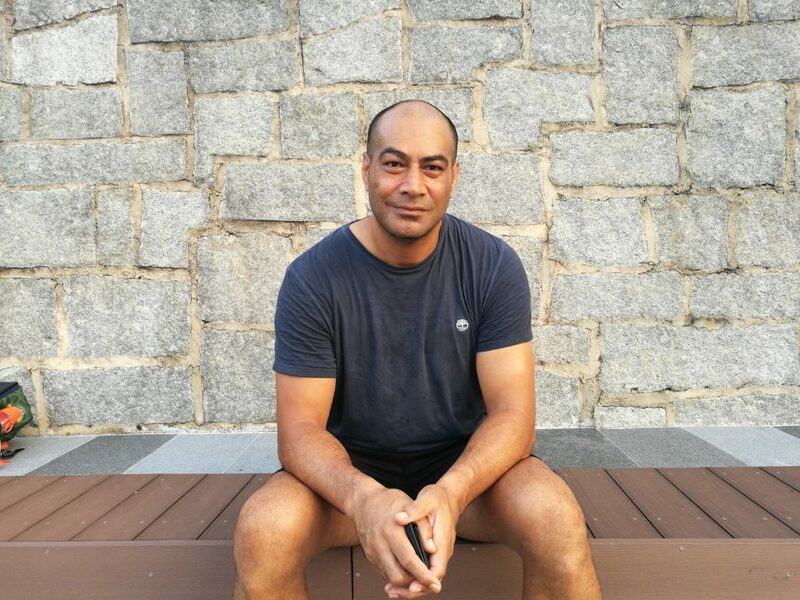 After nearly five years as Technical Director of the Singapore Rugby Union, former Tongan rugby captain and Super Rugby star, Inoke Afeaki, has departed Singapore for pastures new. Inoke was born in Tonga but moved with his family to Wellington in New Zealand when he was young. He’s played for the Wellington Lions, the Hurricanes in the international Super 14 competition, moved to Japan in 1997 to play for Secom and later played for Ricoh Rugby Club before moving to Wales to join the Scarlets. He’s representation Grenoble and later signed for Saint Etienne in 2009. In 2003 he captained Tonga in the Rugby World Cup. Inoke ‘s father and uncle are both former Tongan internationals and when he captained Tonga in the 2003 Rugby World Cup his younger brother Stan was part of the team. As him and his family leave Singapore, Inoke talks to the SCC Rugby Academy. We asked him what kids really get out of playing rugby. Well, rugby is one of these wonderful sports that the British knew quite early on represented a template of their community. It allows for different sizes, I am tall and lanky and so my job is to jump and catch the ball. So there are specific roles for different people of different sizes and skill set. It can involve the whole community. In the professional game you really have to be a super athlete, that’s fine but only about one percent of the playing population can be that, the rest are average people who are pretty mad to get out there and bump their bodies about and risk injury but that is the nature of the sport. It’s more about working together and building relationships. Teams that have better relationships among themselves are the ones who usually win. A great team should have great relationships; it’s like a show of the strength of the community. In New Zealand there is no real class system, if you are good and you want to learn then it gave people like myself, as an immigrant to the country, a footing into society. I managed to be a young immigrant who survived a bit of racial taunting, and that does exist, but once people appreciate you are good at something they accept you. The game allows outsiders to blend in. Rugby is a template for any community. You’ve been Technical Director of the Singapore Rugby Union for nearly five years, what have you got out of the role? It’s been a lot of work over the last few years here but it’s been good and I have learned a lot in the process. I came over here as almost like a young coach and the coaching side has been tough. I’ve played rugby in many different countries, countries that have pretty disorganised grassroots rugby and national teams, to countries like New Zealand, obviously one of the best in the world. I have a good grasp of where Singapore is, in terms of its rugby. There are so many variables to consider before you can get that momentum to take rugby forward here. What’s needed is a calendar that is logical from grassroots rugby all the way to the top, there always needs to be that steady progression. Some schools in Singapore are great at rugby, with great infrastructure and great budgets to work with, but unfortunately that’s not the story in all schools and there isn’t a level playing field. There are a lot of kids in Singapore wanting to play rugby and a lot of kids deserve better coaches and the opportunity to play and that was part of my role to up skill coaches, to get very good coaches at the top and start filtering that knowledge down. In my view the easiest way is to have a flagship, something for children to aspire to and that’s the way I learned rugby. We are attempting to improve things from the bottom up and that’s hard if you don’t have the big players, like the schools or other variables that don’t share the same vision. We want the game to grow and talent to go to where it should be and quite a few players I’ve been working with have reached their goals, which is very satisfying. You were born in Tonga, how do kids get into rugby there? Although I was born in Tonga I actually didn’t grow up there as my parents moved to New Zealand when I was only three years of age. I went back and started playing for Tonga at the age of 20 and there’s no grassroots rugby there, kids tend to play volleyball or netball. Rugby isn’t an organised sport until the schools take charge and being in the British tradition playing rugby for your school in Tonga is very prestigious. Anything to do with rugby sub 12 years old is pretty disorganised and the game is just played on a casual basis. It’s much more organised overseas. In New Zealand I started playing rugby barefoot at the age of 5 or 6 and it was more about the fun, the mates and things like oranges at halftime which was all part of the fun. I remember getting told off by the coaches to get that orange peel out of your mouth and get back on the pitch without choking yourself! The fun part of youth rugby was real, we have to bear in mind it’s not serious, it’s not about winning. It’s about the kid and their level of enjoyment. If they can learn how to catch a ball reliably at the end of the season, then job done. And the following year they work on a few different skills. You are just about to leave Singapore after nearly five years, what are you going to do next? I can’t really say too much at the moment but it will be working with Olympic athletes and I am excited about that. I am excited about going back to Tonga as well. It’s my country and it’s a third world country but the potential and raw talent is just mind-blowing. I played for the Tongan national team for a period of more than 12 years, I know the people and I know what their strengths and weaknesses are. I’ve now spent 5 years in Singapore where they are good at governance and at executing what they need to do and I will take that back with me. Let’s hope we can see more talented athletes go out there and wow the world. So that’s my job in life, to go out there and wow the world or help other people wow the world! The SCC Rugby Academy would like to send our best wishes to Inoke Afeaki and his family for their new adventure in Tonga. Rugby Union is the national sport in Tonga but how do the rugby stats compare for Singapore and Tonga? Figures from World Rugby (formerly IRB) 2016. The SCC Rugby Academy is a junior rugby club based in Singapore. We offer rugby training and run groups from under 4 years old to under 17. We also offer Touch rugby in age groups U10, U12 and U14. We are affiliated to the Singapore Cricket Club (SCC) and work closely with the adult rugby section, although you do not need to be a member of the Singapore Cricket Club to join the SCC Rugby Academy. We are a non-profit making club with all of our money put back into our club and into rugby in the community. We are run by a committee of volunteers as well as a few paid employees and coaches. Every age group takes part in all the tournaments in Singapore, we tour to Kuala Lumpur once a year as a whole club and participate in the Junior League, our U15s are the current champions in their age group, with our other groups performing well. We train at SCC Dempsey ground, with rugby groups meeting on Saturday mornings and Touch rugby on Sunday mornings. Our club started around five years ago, inspired by a group of rugby players from the adult rugby section of the Singapore Cricket Club. From small beginnings and a handful of players we have grown to more than 450 registered players and at the last count we have children and teenagers who attend around 72 different schools in Singapore. We welcome both local Singaporean children and those from the expatriate community. We offered scholarships for local talented players. What kids and communities really get out of rugby….